We admire creative people who are getting things done (and doing good in the world too!). This series features friends of Open Label talking about their process, and the behind-the-scenes systems, inspiration, and advice that keep them excited to put things out into the world. 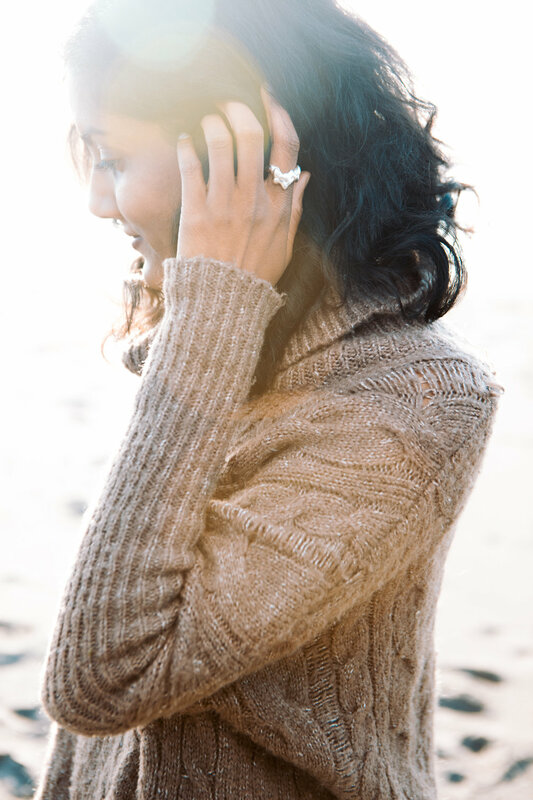 Shilpi Chhotray, the founder of Samudra Skin & Sea — a 100% vegan and organic seaweed-based skincare line, gets more done than anyone I know. Photographer Smeeta Mahanti caught her on a seaweed harvesting excursion to the Mendocino coast for this interview, and in addition to foraging the wild seaweed for the products herself, Shilpi also partners with various organizations to advocate for ocean health, is relaunching her brand in September with completely sustainable packaging, and now she's adding a senior role at the Story of Stuff Project to her resume. She tells us about her creative process and how she does it all below. Open Label: When do you experience a state of flow? Shilpi Chhotray: When I'm particularly passionate about something. I tend to be 'heart first' and it often takes my head a minute to catch up. That heart to head connection is when I have a lot of creative energy and drive to take things to the next level. OL: What is your creative process? SC: I love storytelling and making an impact. Through our core ingredient seaweed, we've built our brand around nourishing, healthy skincare and protecting the ocean. Connecting the dots between concepts that tend to be more abstract and inspiring positive change brings me a lot of joy. OL: What do you do to facilitate your creativity? SC: It's actually not intentional. Ideas come to me at the most random times and when they do, I always have a journal handy to write them down. It's those ideas that I can't get out of my mind I end up driving a creative process around. OL: How do you decide what to pursue? SC: It's 90% gut. I also have an incredible team of women behind Samudra and we are constantly bouncing ideas around and evolving the brand. OL: What systems do you use for recording your ideas? OL: What’s the most difficult part of your creative process? SC: Time. Wish I had more! SC: The ocean and all the living things in it! I can't get enough of our watery blue planet. OL: What are your fears when working on a creative project? SC: I don't really look at them as fears otherwise I don't think I'd get anything done. When I feel them creeping up, I go straight to my community for support. It's important to nip those fears in the bud! OL: What do you get out of making? SC: Constant inspiration, a sense of creative independence, and fueling my desire to connect the dots between healthy skin and a healthy ocean.